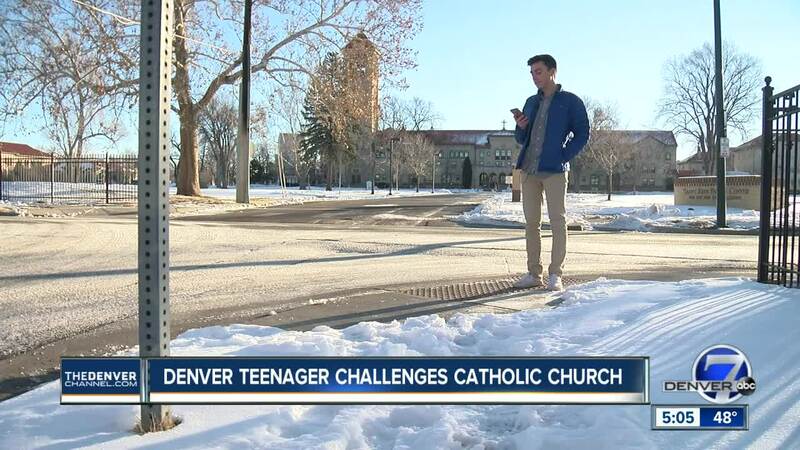 DENVER -- A gay Denver teenager said he wants the Archdiocese to show more love and acceptance toward members of the LGBTQ community. Johnny Hutzapple takes issue with the church's recent invitation of Andrew Comiskey, a conservative Christian who founded Desert Stream Ministries, to host a program on "gender matters." Hutzapple said he penned an essay after learning about the event and seeing a picture of a banner with homophobic quotes attributed to Comiskey. One quote stated: "There's no such thing as a 'gay' person... That is a popular myth." Another stated: "Satan delights in homosexual perversion..."
"When I saw the Archdiocese was promoting such hateful and harmful events, I knew I needed to speak up," the teen said. "I've been dealing with bigotry for a long time and I knew that it was time for somebody to speak out against this kind of hatred." "We didn't make the banner," said Mark Haas, director of communications for the Denver Archdiocese. "We don't know who made the banner. Somebody put it up and took a picture of it. It seems like an effort to make us look bad." Haas said there has been one report by a publication that doesn't agree with Catholic teachings, "and now people are reacting to a kind of misconstrued conception of what happened." He said the message of the conference was one of love, of hope and compassion. On his website, Comiskey states that he wants to equip people to fight for what is right. "To stand on behalf of what is good and holy and true," he said. Hutzapple said Comiskey preaches gay conversion, a form of therapy repudiated by many organizations which has been denounced by psychology's governing bodies and the U.S. Surgeon General’s Office, which says there is “no valid scientific evidence” to support the practice of conversion therapy. The teenager wrote a letter to the Colorado Times Recorder expressing his feelings about that. He included an essay about a particular experience in 8th grade. "I sat down and wrote it really fast," he said, "but it was 11 years in the making." "I am a gay person," he wrote. "I am a homosexual and there is absolutely nothing perverted about me. In Genesis 1:26, God says, 'Let us make man in our images, after our likeness.' Based on Christian belief, humans are made in the likeness of God. I believe this includes STRAIGHT, GAY, LESBIAN, BISEXUAL, TRANSGENDER, or QUEER individuals. LGBTQ people are made in the image and likeness of God." Hutzapple's parents are fully supportive. "It took a lot of courage and I'm proud of him," said Molly Hutzapple. "He spends his time helping the poor. At South High, he helps the immigrant and refugee kids. He does so much good in the world, and I feel like saying to the Catholic Church, 'don't you want him?'" "Gay people are not broken and the fact that you could have conversion therapy to fix what is wrong with them, is harmful and misguided," said Deron Hutzapple, Johnny's father. Haas told Denver7 that the Archdiocese has never used the words conversion therapy, or anything along those lines. He did say the church has teachings on sexuality and what people are called to be in terms of being in the image of God. Additionally, he said there is a need in the church community for people who want to explore what those teachings are. "We had an entire day where you could hear from people, to learn about how the church approaches these issues, to have discussions, to hear from people who have gone through struggles," he said. "It was a conference that was full of love, full of compassion and somehow that message has been completely changed." Hutzapple said he'd like to see that love and compassion extended to all LGBTQ people, not just those who are trying to fit in with church teachings.